This comprehensive guide to home improvement includes the top 100 home improvement projects, all in full, step-by-step instruction, and all from the trusted experts at BLACK+DECKER. Boasting 560 pages of hardworking, how-to instructions and photos, this is quite possibly the only home remodeling you, or any homeowner, will ever need! 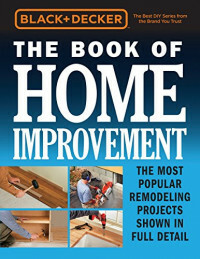 From basements to attics and everywhere in between, BLACK+DECKER The Book of Home Improvement shows you exactly how to do more than 100 of the most popular improvement projects. Whether your ambition is as big as remodeling the kitchen down-to-the-studs, or as modest as changing a bathroom faucet, you will find all the guidance you need to do the job right. This giant book is the ultimate resource and trusted advisor for anyone who wants to make the home a better place to live. Not to mention increases its resale value--and all from the experts at Black & Decker. So stop putting off all the DIY projects that have been piling up! BLACK+DECKER The Book of Home Improvement if the only resource you'll need! In a fast-moving technical and business environment like the Internet only exactitude can guarantee success. An 'almost correct' specification is a wrong specification. Make total accuracy your signature with this invaluable guide.